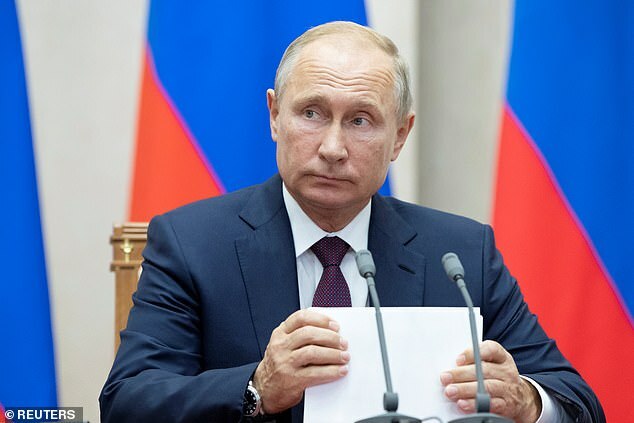 ISIS has kidnapped 700 people from a refugee camp in Syria, and will ‘kill ten hostages every day’ unless their demands are met, Vladimir Putin said today. ISIS fighters attacked the refugee camp in Syria’s Deir-al Zor province last week, and kidnapped some 130 families, including several U.S. and European nationals. Russian news agency TASS, reports that ISIS militants attacked the refugee camp in an area controlled by U.S.-backed forces on October 13, kidnapping around 130 families before taking them to the city of Hajin. ‘They have issued ultimatums, specific demands and warned that if these ultimatums are not met they will execute 10 people every day. The Russian President told the forum that ISIS is expanding its control in territory on the left bank of the River Euphrates, currently controlled by U.S. and U.S.-backed forces. He accused the U.S. and its allies of failing to combat ISIS once again expanding in Syria.